Have you ever wondered what makes magnet advertising so popular with businesses of all sizes? The reason lies in their versatility, affordability, and reliability. This blog discusses about how 10x 13 magnets minimize the marketing cost by one-tenth. Perhaps by looking at the size, you might have understood that it is one of the largest sizes of rectangle magnets available for the purchase. 10 x 13 magnets are loved by people because they are large and lively. At first, it may not make any impact due to the marketing messages, but people would at least consider it as a refrigerator art or car art. They will slowly get attracted to it over the time. This continuous visibility will improve their perceptions about the brand. Also, they will be keen to retain this information for a long time. Large customized magnets 13x 10 can be availed in 20 MIL and 30 MIL, if you are sourcing them from a reputed online eCommerce store. Marketers have been investing in television advertisements and radio advertisements to maximize their outreach. They know that these mediums are expensive and they have to shell out millions of dollars on advertisements. However, large personalized 10 x 13 magnets allow them to market with a difference. As said before, these customized magnets can be indulged for indoor and outdoor advertising with ease. This means marketers can use it for addressing their mass audience while driving. Alternatively, they can use it for pursuing their homebound local audience. Perhaps everyone else in the niche is taking it to print and media advertisements to promote their services. However, marketers indulging 10 x 13 magnets can trounce their competitors by building a loyal customer base. People would love to retain such large customized magnets over their refrigerator doors or car bumpers as long as they wish. The information will slowly percolate into their consciousness and it will make them loyal brand followers. Most online magnet stores stocking these large 13 x 10 magnets offer them with the baggage of goodies such as free art setup, free online design proof, free shipping, and free full color printing. Magnet advertising is unlike other forms of advertising, which rarely offers any price benefits. 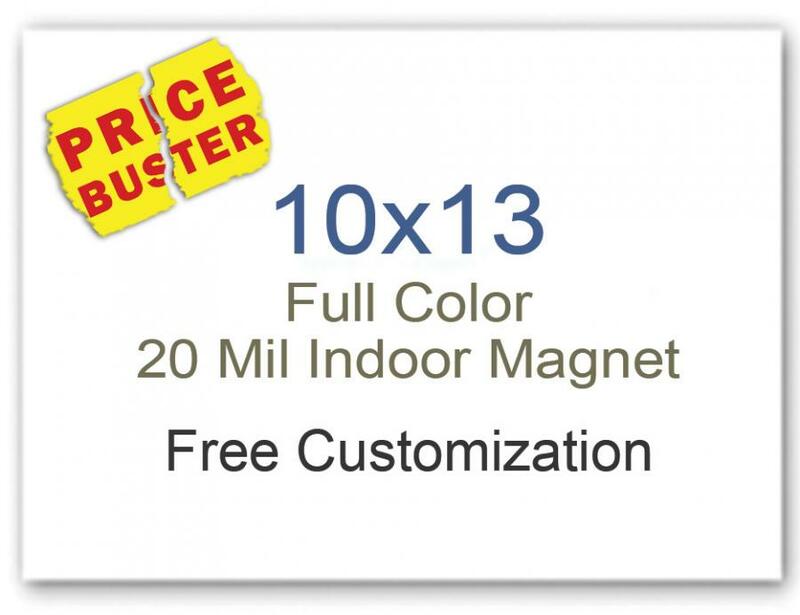 As 10x 13 custom magnets are large, they are perfect for indoor and outdoor advertising. Large refrigerator magnets are rare, but people find them worthy. Large outdoor magnets announcing various outdoor events, social gatherings, and community programs are getting popular by the day. Big sized outdoor magnets 10×13 would work better than any billboard or large sized posters because they can be seen by a large section of people on the move. Your advertisement can make impressions from a parking lot, traffic jam and other crowded places. Don’t you find the above-mentioned factors convincible? By now, you should be convinced that you are going to make better use of saved marketing dollars. Wishing you a great time with these large and consumer-friendly customized 10 x 13 magnets!